Charlie Hodgson gets us going with the wind behind him and his Saracens team mates in the second-half. We are back under way at the Madejski Stadium. Can bottom club London Irish hold on for their third victory of the Premiership season? You could say the Premiership is the delicious starter to the main course that is the Six Nations. After wins for France and England yesterday, Ireland and Wales will be looking to start their campaign with a win in the 15:00 GMT kick-off. Following the conclusion of these two matches, you can follow the match on 5 live sports extra as well as a live text commentary service. We've certainly created a number of opportunities. I think the strategy we've spoken about during the week is working - we need to be clinical in the 22. James Short's try and two Gareth Steenson penalties mean that Exeter will be going top if the result stays like this. Saracens, however, will be buoyed by that try just before the break and will have the strong wind behind them in the second half. Irish win a penalty off the scrum and kick for the five-metre line - but they cough up possession and Wayne Barnes blows for half-time soon after. Very much an attritional battle at the Madejski Stadium. We spent a good few minutes with the Television Match Official there as this was a tricky call. Italian number eight Samuela Vunisa definitely crosses the line with the ball but there was an issue with the grounding, if it was held and and one or two other bits to sort. The try is given though as the ball is adjudged to have touched the white try line and Charlie Hodgson is unable to get his get anywhere near the posts in the wind. London Irish so close to a try with two minutes to go in the first half. The hosts work the ball out well to Andrew Fenby, but he fumbles before he can spray out to Ciaran Hearn, who would have had a free run at the line. Saracens have pushed over a driving maul from a line-out and look to have touched down, but we are with the TMO to decide if the ball was grounded. 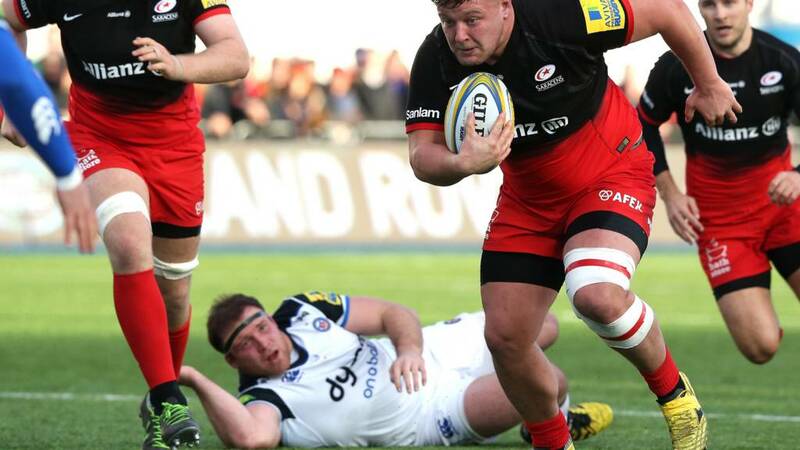 First real sight of continued Saracens pressure as they win a succession of penalties inside the Exeter 22. They go for the line-out for a third time... but Exeter steal the ball as it's throw up! Top defensive effort from the Chiefs that. Shane Geraghty makes no mistake from the tee right in front of the posts. London Irish seven points clear with a few minutes left in the first half. Bonkers few seconds at the Madejski Stadium. Worcester winger Bryce Heem makes a try-saving tackle on Topsy Ojo, but is shown a yellow card soon after by referee Wayne Barnes - who comically got caught up in play. Pressure has equalled points for Rob Baxter's side. Another penalty is won, this time from a scrum, and Exeter decide to take the points as they're closer to the posts. Gareth Steenson boots over his second kick of the afternoon. London Irish have had numerous line-outs around the Worcester 22 so far today, and they almost get through again, but Topsy Ojo can't get on the end of a kick through - instead Cooper Vuna clears the danger. Exeter win a couple of penalties 5 metres away from the Saracens try line, but both times they go for the line-out and are just stopped by the defence. The blue-and-grey shirts of the visitors are holding on a bit here, camped inside their own 22. Ryan Mills has his side on the board against the Premiership's bottom club with a kick from quite some distance. In the context of the relegation battle, this match is huge. Ollie Atkins has the ball down over the try line again for Exeter, but the referee had already blown up for an earlier infringement. Saracens are certainly getting more territory in this wind but the hosts are on top - apparently they have had over 70% of the possession so far. Worcester are struggling to get close to their opponent's line, and after a period of pressure in the Irish half, they are penalised for not releasing. We've had to wait 18 minutes for the first score, but it was well worth the wait. Worcester's Chris Pennell tries to break through in his own half, but Irish turn the ball over and Ciaran Hearn spotted a gap, kicks over the top of a couple of Worcester players and ran in unopposed under the posts for his second try for the club. Shane Geraghty then converts the easiest of conversions. Former Saracens man James Short continues his excellent recent try-scoring record. It comes from a Sarries attack as Charlie Hodgson tries to offload close to the try line - but the Exeter winger reads it perfectly and runs the length of the field to touch down. Gareth Steenson unable to add the extras out wide.